in our local Spar shop on Sunday. since my dad ran a sweet shop in Artane (Dublin) in the 1970s (when everybody smoked). Given the common knowledge that cigarette companies sales are in terminal decline and as a result they are targetting younger and younger demographics, isn’t it somewhat irresponsible to be selling such lifelike cigarette sweets? Next ›.ie domains – Why would you bother? us ignorant enough to not know what it means. Its a purely personal thing. Used to be something we would shout at each other as kids. It also happens to be a pretty good opening hand in Texas hold ’em. We liked to shout “Lorca” for aces declared at the end. Cos they were also called bullets, and they were in the hole, and we were operating under some illusion that Lorca was shot in the hole (eh, you know, sorry). King 7 became known as the “Declaration Hand”. We dealt the cards one night and picked up our cards to study them. One guy studied his carefully and said “hmmm King Seven”. We all looked at him. He looked up and said “Did I just say that out loud?”* We agreed there and then that anyone who got King 7 in the future was obliged to declare it. *these games were usually played under the influence…. Silly question , but can you tell me is the paper around the sweet cigarrettes edible sugar paper or not, and why have they been banned? 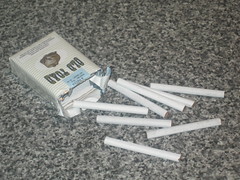 Sweet cigarettes don’t have paper round them. They were banned because pretending to smoke sweet cigarettes is the first step down the line to smoking real cigarettes. 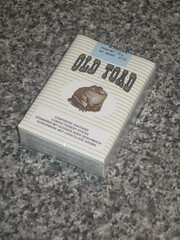 Joe obviously didn’t eat said confectionary product, or he would’ve realised that Old Toad (and other fictional brand) cigarettes come wrapped in white paper… as pictured. All my life I’ve never known the answer as to whether the paper covering the chocolate is edible (ie, rice paper), but I’ve always eaten it anyway – much to my friends’ disgust. I don’t smoke, I’ve never smoked, but I enjoy “confectionary sticks” and “candy cigarettes” for the taste. Canada, all legal.